Switzerland's cities of Bern, Geneva and Zurich are commonly ranked as the top 10 most livable cities worldwide. Switzerland has three main topographical regions including the Swiss Alps, the Swiss plateau, and the Jura Mountains. Switzerland's highest mountain is Monte Rosa, sitting at 4,634 meters tall. Switzerland is famous for manufacturing many luxury items including watches. They make half of the luxury watches in the world. The oldest watchmaker in the world with an uninterrupted history, Vacheron Constantin, was founded in Switzerland in 1755. Other famous Swiss items include cheese and chocolate. Citizens of Switzerland consume more chocolate per year, per person, than citizens of any other country in the world. Popular sports in Switzerland include mountaineering, skiing, and snowboarding. Switzerland's largest lakes are Lake Geneva, Lake Maggiore, and Lake Constance. The Vatican in Vatican City is protected by the Swiss Guards. They are the only citizens of Switzerland allowed to serve in foreign militaries. Traditional Swiss wrestling is called Schwingen. Hornussen is a traditional sport in Switzerland. It is a cross between golf and baseball. Switzerland encompasses an area of 15,940 square miles. In 1863 the International Committee of the Red Cross was founded in Geneva, Switzerland. This remains the ICRC's home base. Switzerland has more than 1500 lakes. It accounts for approximately 6% of the fresh water in Europe. 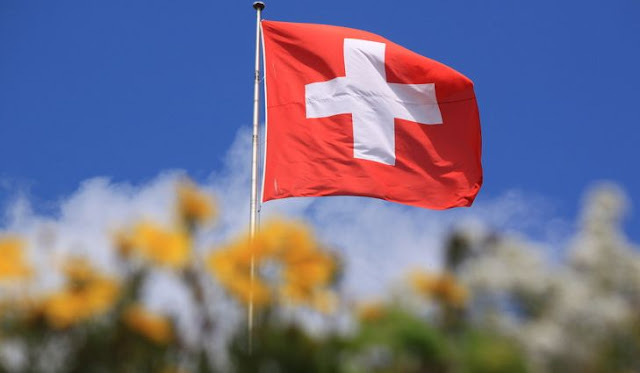 There are four official languages in Switzerland including Swiss German, French, Italian, and Romansh. Switzerland did not join the United Nations until 2002. Switzerland's country code is CH, which stands for Confoederatio Helvetica, which is Latin for Swiss Confederation. Switzerland's population is estimated to be approximately 8 million. Switzerland has one of the highest life expectancy in the world. Of all industrialized countries, Switzerland has one of the lowest crime rates, even with fairly liberal gun laws. The largest city in Switzerland is Zurich. Women in Switzerland were not given the right to vote federally until 1971. Switzerland's capital city is Bern. Switzerland has not been at war since 1815. It was briefly occupied by France between 1798 and 1803. Approximately 6% of Switzerland is made up of glaciers and lakes. Part of the Alps that run through Europe are within Switzerland's borders (known as the Swiss Alps).